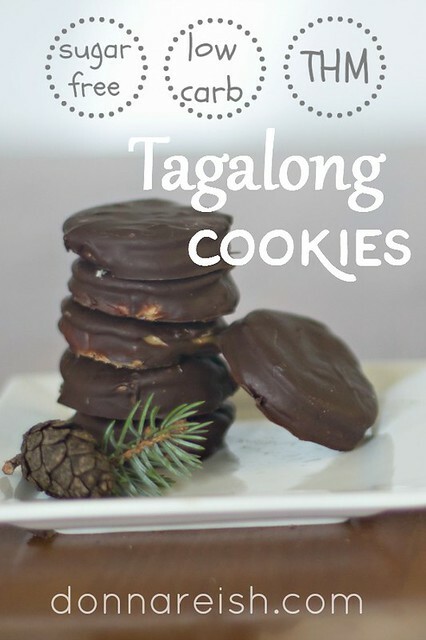 Well, they were Tagalongs….but I never took the time to make them pretty. I just crisped up two low carb tortillas, spread peanut butter between them, and drizzled melted chocolate over all. A big, yummy, chocolate-peanut butter mess. But a delightful one, for sure! So I’m giving you the “proper” version of them. My recipe assistant made them beautiful. (I’m more the brains behind the operation—and she is more the beautifier—at age thirteen!) She brought the perfect sized biscuit/cookie cutter and painstakingly cut out the little circles, crisped them to perfection, spread the peanut butter filling, and then dipped them so that they truly do look (and, honestly…..taste!) 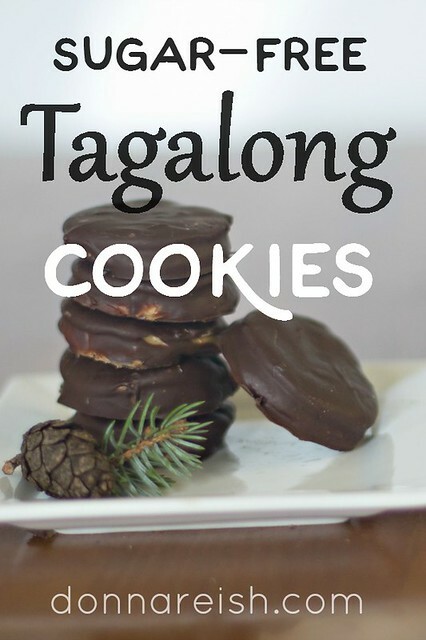 like Tagalong cookies! Note that you can use all chocolate chips or all milk chocolate bar, depending on how dark you want the coating to be. 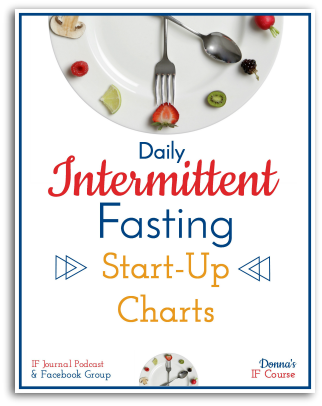 I wanted to include this one here (and in my first Healthy Mixes book—Sugar-Free, Flour-Free) simply because I want to help people get started incrementally and inexpensively (and without having to learn too much information all at one time). This only requires peanut butter, sweetener, chocolate, and healthy tortillas of your choice. Great place to start on sugar-free treat making! Cut healthy tortillas into rounds with small biscuit or cookie cutter. Use one that is approximately the size of an Oreo cookie. Place the tortilla “cookies” on a single layer in a pie pan (approximately 36 of them) in microwave (might need to do it in batches). Crisp them on high for thirty seconds. Turn over, move around, etc. And crisp for another twenty to thirty seconds. Then crisp for ten second intervals until the rounds are crispy like crackers. Melt peanut butter and butter in microwave until soft but not liquidy. Stir butter with peanut butter until smooth. Top with remaining eighteen cookies. Freeze “cookies” for fifteen to thirty minutes to make them easier to dip. Using one cookie at a time (leave remainder in freezer), add the cookie to the melted chocolate and use a fork to coat both sides. Transfer cookie to parchment-lined cookie sheet and continue with remainder of the sandwich cookies. Freeze on trays (or refrigerate) until chocolate is firm. Transfer to plastic container. May be stored on the counter, refrigerator, or freezer. 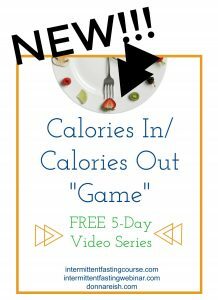 Very Low Carb (VLC): This is a very low carb recipe! It is also high in fat with the chocolate and peanut butter. It is a wonderful keto cookie and great THM S snack. Store-Bought-Stella (SBS): Store-Bought Stellas rejoice! No shortbread or peanut butter cookie to make before you ever make the cookies. Uses ingredients you can purchase—tortillas, peanut butter, chocolate chips, and chocolate bars. Freezer Cooking (FC): They are in my freezer right now—ready for the holidays when everybody else is eating M and M cookies! 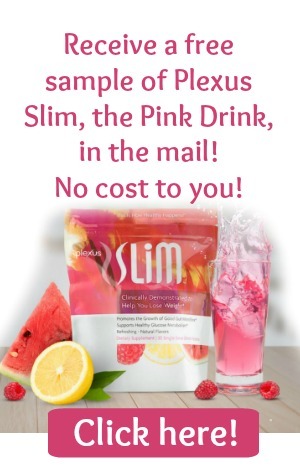 Trim Healthy Mama-Friendly (THM) (www.trimhealthymama.com): This is a perfect S treat! It would be challenging (if not impossible to make it an E—omit oil or butter, use peanut butter made with peanut flour, drizzle rather than dip in chocolate. Possibly…but it would be a stretch. 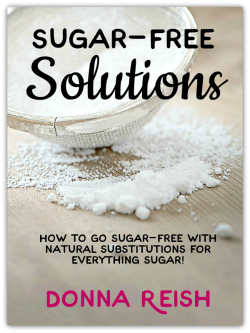 Sugar Free (SF): All of the Healthy Mixes e books, blog posts, and newsletters contain only sugar-free recipes. Trust me, though. This one does not taste sugar-free! 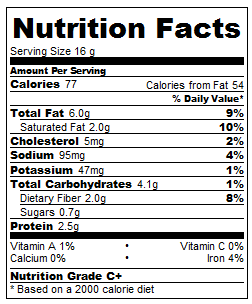 Gluten-Free (GF): This can definitely be gluten-free as long as you use gluten-free tortillas.